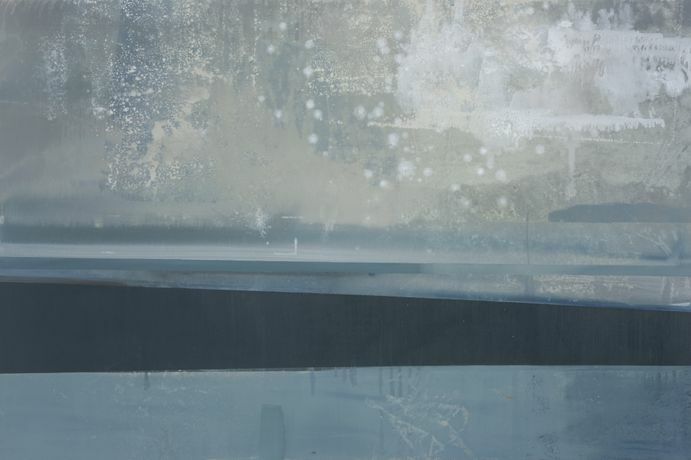 In these recent paintings Daisy Cook has taken the point where the land meets the sea and sky on the easternmost edge of England as a starting point. She has long been fascinated by the interplay of light, land, water and sky and this margin of the landscape reveals a myriad of possibilities to explore these relationships. This coastline bears the scars of powerful erosion by the North Sea and is mutable, fragile and constantly changing. It holds within it a rich history and reveals its stories to those who search them out. The art critic Andrew Lambirth descibes Cook’s paintings as ‘abstract imaginings’ and while she uses the language of landscape to put down her ideas, it is really a ‘journey’ in paint rather than a depiction of place. “I begin by pooling paint in very liquid form and let it run and eddy into the canvas creating the first shadow or trace. Over time I slowly build up layers, creating textures by pressing material or paper into the wet paint. I tend to use earth colours and Prussian blue and occasionally a hint of pink. I will often lay a harder or opaque surface on top of a more ambiguous area to give the feeling of collage and a tension between these planes”. Born in 1965, daughter of the legendary Peter Cook, Daisy is a self-taught artist who has been showing successfully since 1999. Continually refining and developing her work, this show promises to be a new high point in that development, where her quiet vision is expressed with an increasingly sound technical ability with paint. The paintings will look particularly good on the walls of the North House Gallery lit from the north by the changing light from the estuary of the River Stour.